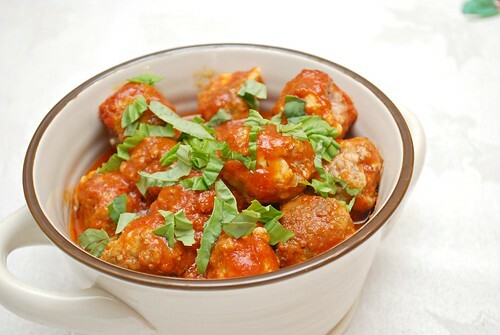 In a large bowl, combine all meatball ingredients in a large bowl; stir until combined. Shape into meatballs (about 2 tablespoons each), tucking in a piece of mozzarella inside while ensuring it is completely enclosed. Press SAUTE on the IP and add 2 tablespoons oil. In batches (depending on the size of your IP), lightly brown meatballs. Once all meatballs have been browned, remove from IP and set aside. To prepare the sauce in the now empty IP pot with any fat/oil left behind from the meatballs, continue to set on SAUTE, add chopped onion, garlic cloves, and basil; cook 4 minutes or until softened while stirring frequently. Add tomatoes and sugar; bring to a boil. Return the meatballs to the IP. When the IP beeps after pressure cooking for 7 minutes, allow your IP to naturally release pressure for 15 minutes. While naturally releasing pressure (also known as NPR or NR), the display will reflect numbers counting up from 1. The numbers indicate how many minutes the IP has stopped cooking since it beeped (or how many minutes it has been naturally releasing pressure). No need to touch your IP while it naturally releases pressure. The pin at the top of your IP will drop when all pressure has been released and it's safe to open. Using tongs, remove the meatballs and serve with sauce.